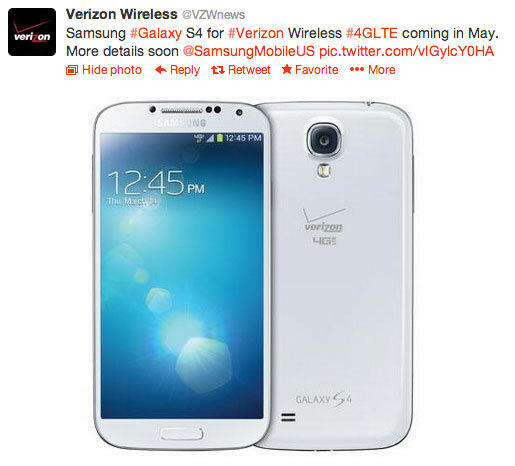 Verizon has confirmed the Samsung Galaxy S4 will be available on their network during the month of May via Twitter. As we have seen, some US carriers have announced the availability of the Galaxy S4 and they also have opened pre-orders. Even AT&T has announced that the smartphone will be shipped on April 23 and T-Mobile has unveiled an exact launch date for the S4 at May 1. As just about every other US carrier has given out release information on their version of the Galaxy S4, it’ nice to see Verizon say something even if it is just the month. With May right around the corner, I’ve a feeling we’ll know more soon. I remind you that the Verizon Galaxy S4 sports a 5-inch full HD display with Super AMOLED technology, while being powered by a quad-core Snapdragon 600 chipset with 1.9 GHz Krait cores and Adreno 320 GPU, plus 2 GB of RAM, and microSD card slot. The smartphone has all the connectivity features of a modern smartphone like 4G LTE, WiFi in all standards, NFC, infrared port, and Bluetooth 4.0.